I don’t eat a lot of steak but I know where you can find the best steakhouse in New Orleans. It’s a couple of blocks from our small personalized New Orleans hotel. It’s old school, the way better steak houses tend to be. If you like new-fangled steakhouses, all flash pounding techno music, well, this won’t be the place for you. Me? I like old school. I like old school so much that I live in New Orleans, a city in which old restaurants that don’t try to improve on perfection are revered and supported. If you’ve talked to me about this over breakfast, you know where I’m talking about. I’m talking about Crescent City Steaks. I don’t eat a lot of steak so I don’t go to Crescent City Steaks every week. This week, I went twice. Two nights, back-to-back. I love Crescent City Steaks. The restaurant is air conditioned. 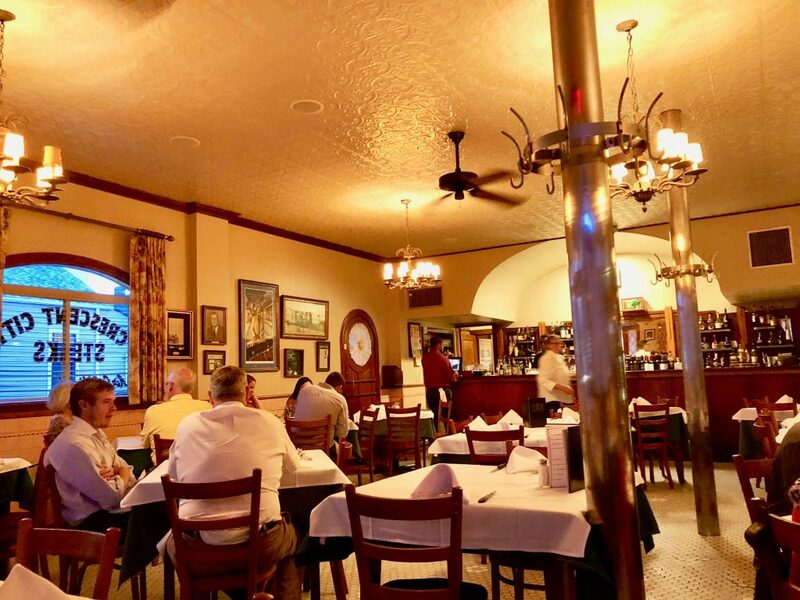 Some things don’t need to change, like the dining room at Crescent City Steaks in New Orleans. Old school is best school. Frau Schmitt, who is the better half of this operation, is out of town this weekend, so I went to Crescent City Steaks for dinner on Wednesday night (we have long weekends in New Orleans). Kelly, the hostess, recognized me from previous visits and she sat me exactly where I wanted to be: by the door that nobody uses anymore, where I could have a commanding view of the dining room. It was a busy night, but, it being the beginning of August in New Orleans, it was slow. August is the slow season in New Orleans. I had an old fashioned and a bacon-wrapped filet mignon, well done. I know, I know. I like everything cooked well done. We can talk about that if you want to but let’s not interrupt the flow of this tale. THE BEST STEAKHOUSE IN NEW ORLEANS. I really enjoyed my meal on Wednesday, so, as I was leaving, I asked Kelly if I could come back on Thursday and sit in the same chair at the same table. “For you, Mr. King? But, of course,” she told me. What did I tell you? This is the best steakhouse in New Orleans. So Thursday evening rolled around and I walked up to Crescent City Steaks. It’s only about a seven minute walk from La Belle Esplanade. I walked in the door and I was greeted. “Hi, Matthew. Come right this way.” Kelly took me to my pre-arranged table and it had a little “RESERVED” sign on it—for me. That was a nice touch. I didn’t have the filet last night, I had my favorite meal at Crescent City Steaks, which isn’t steak. I had the shrimp salad with their homemade bleu cheese dressing (it’s not creamy) and German fries. German fries are a boiled potato that has been sliced and then deep fried. I love this meal. About Your Steak: I like mine well done. My third favorite meal is the steak, with sides of German fries (I love those German fries) and asparagus. My second favorite meal at Crescent City Steaks is the broiled lobster tail with…..German fries. Lobster is not native to New Orleans and I never order lobster anywhere in New Orleans except at Crescent City Steaks. I know it’s a frozen lobster tail from the Gulf of Maine. They upfront about it if you ask. They broil that lobster tail so well, though, it’s my second favorite thing to order at Crescent City Steaks, which is the best steakhouse in New Orleans. While I was taking pictures around the dining room last night, I reversed the camera. Shield your eyes!!! I was looking into the camera to take a picture of a table across the room. Now, there’s a face made for radio. If you want to learn more about New Orleans restaurants and The New Orleans State of Mind, I know a nice small hotel where you can stay to immerse yourself in this wonderful city Frau Schmitt and I call home. …ranked the #1 place to stay in New Orleans and in Louisiana, #3 in the U.S., and the #17 place to stay in the whole world. August 3, 2018, Friday: I don’t know where I’m going for dinner tonight. When you live in New Orleans and you have the kind of job I have, you eat out a lot. People in New Orleans talk about restaurants more than they talk about the weather. To learn more about New Orleans, you know the right website to make a reservation at the most unique tiny personalized hotel in America’s Most Interesting City.